The new SL R231 has more conservative lines and some unique design features. The big front hood is very elegant but the enormous headlamps with 3D design might not suit every taste. The back of the new Mercedes SL is looking sporty and yet elegant. The roof line is almost the same as the previous generation SL. 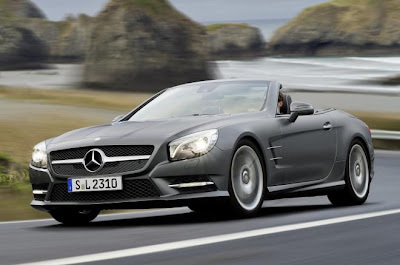 As a genuine roadster the 2013 Mercedes-Benz SL keeps the two seat configuration which allows for driver and passenger to enjoy the spacious seats. The new Mercedes SL 550 will be offered with a 4.6-liter, direct-injected, twin-turbo, V-8 engine which will produce 429 hp and 516 lb-ft of torque, plenty of power for the new luxury roadster.